I would rather have multiple 0.001% drops that could drop from every monster in the game. Maybe a bit higher % for stronger monsters, since they take more time to farm. These would be basically "World drops". And you don't really farm them directly, you just find then by playing the game normally. Sure you could be defeating monsters with the purpose of finding one of them, but you would not be forced to farm the same place repeatedly, doing the same boring, mindless thing for hours. You could just find them while already doing something else. I believe this could make the game a bit more exciting, as you could get something special, even if you were just repeating an old dungeon. They should probably change the loot system though. Checking every single bag is tiring. 1 in a million is still too low a chance. The noise level is extremely high; at such a ridiculous level, it's easily possible that players could perform the trial (whether it's killing monsters, or farming a particular spot) 2 million times- twice the 'probability' and acquire nothing. Especially given how many players there are. It's been some time since I studied probability theory, so I can't demonstrate the maths off the top of my head, but many of these things are quite obvious. In general, I'd avoid chances of more than 1 in 100; 1%. That way, it's relatively replicable. Essentially, in my view, if the noise level is at the point where the players couldn't determine the drop rate accurately, it's too high. 1 in 100 is already barely achievable for most players, and we're talking about a drop rate that is 10,000 times lower. If you want any guarantee that the players will get some item from random drops, well, you'd need to do a fair bit of maths, taking all the items into consideration. But a greater number of small chances is less likely to align fairly than a smaller number of bigger chances (assuming these chances are proportional to each other; x number of y chances is more random than y number of x chances, if y<x). Essentially, 100 1-in-100 chances is more random than 2 1-in-2 chances. There's also no way of determining whether an item is a hoax or not; imagine being convinced to farm one particular area a million times for an item that doesn't exist. For good reasons, it's against the rules of all AE games to redistribute or sell accounts; but manufacturing rarity enables people to create accounts to farm the item, which they may then sell. That sort of thing is completely illegal now (at least in Australia), but it still happens. Once monetary value is associated with these products, gambling laws come in at full force. If this became a problem (I suspect AQ3D will be too small for this, though), the game would be banned and/or fined. What value is associated with an account that has 2 1 in a million drops? Is that really a question we want answered within AQ3D? Yeah. A trading feature by itself is VERY risky. You could make even those items bound to your account, but there are still problems. About chances to get super rare World drops, I think it would be pretty balanced to at least find two items across the current leveling progression. You could reach max level and have some rare stuff to show for it (and so would others, except they would probably find different items than yours). There should be a big pool of different items. While individual item drop% would be slim, as a group you would have a more sane chance of getting at least one or two without wasting your time away. Or you know forgo rngesus for the much more reliable and just as grindy super long and or difficult quests. .0001% thread merged with Feedback Thread. After the 1.4.7 update damage is way down, I'm not a big fan of this (as are other players) as it is harder to defeat monsters than it was before. Another thing I don't like his how the crit, evasion, and haste stats are displayed as they are very confusing to read when not in percent form (776 crit, what does that even mean?). I got 778 casting speed! Okay, but I still attack abysmally slow... cool. The auto-attack speed is still unaffected by haste. I hope they include it at some point. This is their very first step. I'm pretty sure they will display percentages too as they continue the stat/class overhaul. I agree that the new stat system is confusing to look at, and the UI does little to explain them. What do they exactly do, and what is the magic behind those numbers? I still don't understand how haste and crit work, if not every stat. I still don't get the values in the new stat system. I still find Warrior and Mage out of shape in terms of functionality. I think Warrior should have a better defensive skills and be able to taunt enemies. Sorry if this has been brought up somewhere before, I wasn't able to find anything about it. I recently started playing but I play exclusively on mobile. I've found a few issues here and there but by and large the most annoying one I've found thus far is the chat interface. The new update allows you to resize the chat panel, but that's not really where the issue is. Rather, it's the fact that the landscape text entry box covers the entire screen, so you can't see anything except what you're typing. Landscape chat box (sorry for the huge image!) 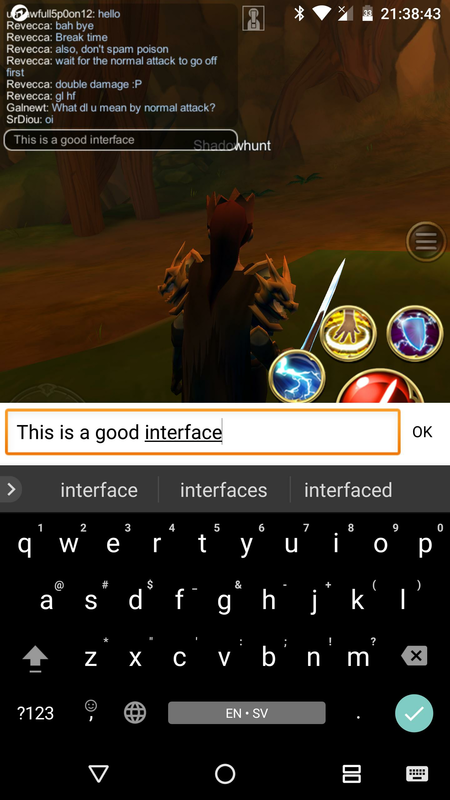 is a bad interface because you can't see what is going on in-game while typing out a message. It makes it easy to miss other messages if you're talking with a few people, plus you have absolutely no interaction with the game. However, if you play the game in portrait, the chat box is much better. It still covers some stuff up, as you can see, but it doesn't cover the entire screen so you can still see messages or interact with the game while composing the message. This would be a much, much better default chat box interface, in regards to it not covering up the entire screen. The single bar is plenty, you don't need the entire screen to be your text entry box. Playing in portrait mode brings with it its own host of issues, of course (like the status bar being persistent), but it does solve the chat box issue. I'm no expert on chatboxes in mobile mmos but mine looks like this. Though, I highly doubt I would ever use this to communicate while in the midst of combat unless I really wanted to get myself killed. Unfortunately, using it when I'm already dead may be the only time I would resolve to it. Honestly, I wish there was a better way for them to implement chatting but I don't really have any suggestions. They could consider making the playing screen smaller and have a bottom portion of the screen designated for the typewriter only which would only appear if you are chatting. However, this would mean the screen would have to be even smaller and since the iPhone I currently play on (when I'm on mobile) is just a normal size iPhone, I doubt this would be a good idea. 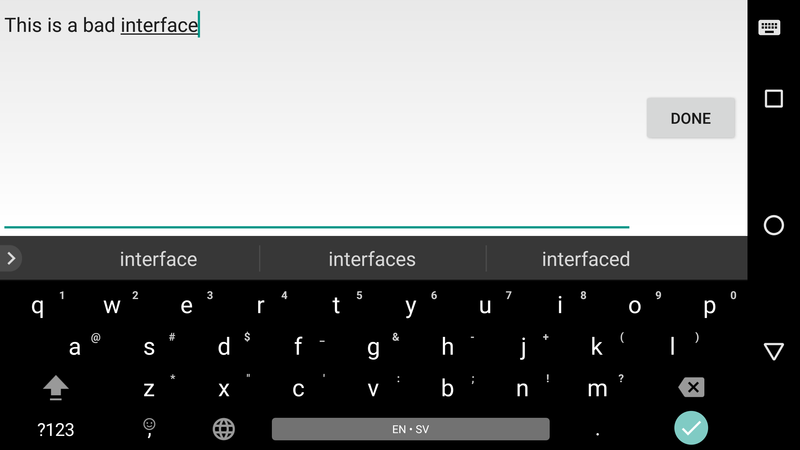 I'm pretty sure the landscape chat box being like that is an Android OS thing with the way unity handles EditTexts. Not sure if AE can do anything about it. I love this item, I use it as a cosmetic all the time. But one think keeps bothering me. It is not affected by light, ambient color, or even darkness, like other items. Because it looks so visually out of place like this, I thought it would be fixed at some point, similar to how they fixed Nightlocke scythe and made it only partially luminescent in the dark (before, it too wasn't affected by changes in light). If we can't have both, I would really rather have it being static but be affected by changes in light/color. The LOVE the waving movements, but I hate the weird light/color even more! I think having exp distribution of 65%/60% EXP from the Main Quest, 20%/25% EXP from Monsters and 15%/10% EXP from Dungeon Quests is better than 70%-30% EXP distribution from Main Quests and Monster Grinding only. It's really sad to see low-level dungeons being abandoned/ignored by newbies. Is there a reason why my Crimson Staff of the Abyss lost 42 attack? It's attack is lower than Scale Slayer now. Even though it's lvl 17 compared to Scale Slayer's lvl 16. Just because something is higher level, doesn't mean that it has more of certain stats than other items, the Necrohen hat and Braintick helm has more attack then the Scale Slayer helm, even though they are both lvl 15 compared to the Scale Slayer Helm's lvl 16. The Scale Slayer helm does have more total stats though, which does make it an overall better item (in theory). It's the same with Scale Slayer vs the Crimson Staff, sure you can get slightly more attack from the Scale Slayer, but you will lose more total stats than you will gain Attack from it. If I were to guess, this is just another part of the long term balancing, you need to remember that no item has finalized stats yet, every new update can bring some stat changes to the table. I'm pretty sure either the Staff, or some other item, has gotten a health boost though, because I have more hp than I used to. Honestly Im reeeeeeeeeeeeeeeeeeeeeeeeally unhappy about the Crimson Staff of the Abyss nerfing. I spent a ton of time and money on that thing and we are arguing about whether or not it is the best item. It should BE the best weapon in the game period and there should BE NO DOUBT it is the best weapon in the game period. NOTHING in game comes even close to the grind fest it was to get this thing. The other weapons required *literally* less than a TENTH of the resources and time to get. On top of that, its the ONLY level 17 epic weapon in the game. It should be the best. by far. The Crimson Staff is fine where its at. It still is the best weapon but not as unbalanced as it was back then. I really don't get why people have to grind for the new best items when the level 16 gear aren't too far behind, the level 17 items will be outclassed by the next new powerful set of items eventually. If you grind for the challenge and not only because said item has the 'best' stats then that's fine. What are you even gonna use the extra stats for? The next few updates will still be playable with slightly weaker gear and you don't really have much to do in the game at this stage anyways. You don't need the most powerful late game gear for a PvP or PvE competition thing anyways since we don't have those yet. I really like how they integrated the 'Battle' function from the original AQ with random adventures. It'd be nice if they also included there the components of the Blade of Awe as a random chance as well just like back then. Ahh.. nostalgia is soo good.. I added a new edit on my post on the suggestion thread for this. I just got the alpha pirate set and Im sadden that it doesnt have a weapon and cape to go with it. Hope we can get them because I really like sets with matching items with it. How are you "just getting it" is what Raoros meant, I think.